Performing a technical SEO audit is daunting. Whether your site is big or small, getting into the nitty-gritty of your site's technical performance can feel overwhelming. With so many elements and items to review, consider, and perhaps fix, it's no wonder that performing a site audit is a source of SEO anxiety. Performing a technical site audit doesn't have to be all that intimidating. To ensure it isn't we went ahead and created an all-new Site Audit Report aimed at simplifying the barrage of data normally associated with technical SEO audits. Here's how to use our new Site Audit to gain straightforward, clear-cut, helpful, and emboldening technical analysis and insights (so that you can breathe easier the next time you need to do a site audit). The Site Audit Beta Report is a part of our recently launched Beta Blitz… but Beta Blitz is just too big for one post! We felt the Site Audit was so important that we should discuss it on its own. This beta report, like the others, is open to all (and using it won’t incur any new charges for our current users)! Knowing where to start, in my opinion, can be the most exasperating part of a site audit. Should you focus on indexation, links, or even content issues such as duplication? We've tried to take the guesswork out of where to begin. Let me rephrase that. We've worked to make it easy to know where to start so that you don't have to rely on guessing. To get you started we've put an overview in front of your eyes at the onset (which of course is quite logical). The Site Audit Report's Overview is broken up into distinct sections (Content, Indexation & Configuration, Links, and Performance). Each section contains a breakdown of the elements it contains. So for links you'll see Broken internal links, Internal links with nofollow, Broken external links, etc. Next to every element is its status. Meaning, if there are errors, a big and clear red box shows up that appropriately says Error within it. More, the report tells you how many items have an issue both numerically and as an easy to digest graphic. The upshot is that in literally less than 30 seconds you'll know where your major issues are and how pervasive each problem is. Once you've surveyed the field, you can identify target areas to focus on by capitalizing on the widgets within the Content and Indexation & Configuration sections. After identifying an overall area of focus, use the widgets to help qualify just how pertinent any issue you have might be. That is, just how extensive is your duplicate content issue, how much of your site consists of some form of duplication, and so forth. Let me walk you through how I might go through this process by looking at an actual site (we'll keep the site confidential, "errors" can be a touchy matter). Based on the above image, it looks like I have some big issues with duplicate page content here as well as a broken internal link. The broken link is a broken link, but I don't know what 43 instances of duplicate content means relative to the amount of content on my site. That's where the Original vs. Duplicate widget comes in handy. By looking at the widget I can see just by the amount of red contained within it, that I have a decent amount of duplicate content. Specifically, out of 896 total pages, 43 of them contain duplicate content... not good. I want to mention that there is a time and a place to jump right into your site's "errors" without first surveying the field so to speak. To do that you can just click on the Issues tab within the Site Audit Report. Once there you'll get a list of items organized per status. Meaning, you'll see all your errors under the Error label, all of your warnings under the Warning label, etc. By using the Issues tab you can get a quick glance at all of your errors, be they content errors, link errors, and so forth, and then you can take it from there. It's a great way to get a feel for where things stand if you're short on time or just want a quick look into things. For now, let's continue on our journey through an easy to execute site audit by heading back to the Overview and to our duplicate content errors. Obviously, with 43 duplicate content errors, it would be nice to know what specific pages we're dealing with here. The best way to get going here is to click on the element you're interested in. In this case I'm going to drill into Duplicate page content (by simply clicking on the element within the Overview). The Site Audit Report takes you right over to the Pages section of the Site Audit Report which shows you the very pages that contain duplicate content. The thing I love best about utilizing the report this way is that it will show the metrics relevant to duplicate content without me having to do anything. In this way, the report is in a sense guiding you to the information pertinent to you as you drill down into the site audit. At the same time, you can custom select which fields you do and don't want to be displayed. In our case, I'm going to make use of that. Earlier I saw the site had a broken internal link. So I'm going to go ahead and add a column to show my broken links. The idea here is to sort of kill two birds with one stone by picking out those pages that have both duplicate content and broken links so as to be able to focus on the worst of the worst first. However, as you can see above, no pages that contain duplicate content also contain a broken link. It was worth a try. For now, I've sorted my pages by Issues so that I can see which page is the most problematic from a quantitative perspective. Once you've sorted your pages according to your preferences you can dig into the entire page's profile. OK, so let's click on the page that contains duplicate content and that has the most issues (seems like a good place to start). Looking at the audit of this page we're clearly told that there are some duplicate content issues. We also see that the Status Code here is fine and that the page we're talking about took two clicks to get to from the homepage. Meaning, it's not like the crawler had to dig that deep into your site. The page is easily accessed from the site's menu and is a page users could very well click on and is most likely a page you very much want to rank well. It also contains an enormous amount of internal links as well. For convenience's sake, the page's URL is right there so you can head over should you want to familiarize yourself with the page. If we move down the report we'll find a full list of all of the issues the page contains. Each issue is color-coded according to the labels we saw on the report's overview (i.e., red = error, orange = warning, etc.). From the look of things here, the biggest issues are in fact the duplicate page content per se (as opposed to thin content) along with some duplication in the "tags" and so forth. Meaning, beyond cleaning up the text itself, I would need to look at the H1 and the description, etc. If you're looking to learn more about what an error means, this is a good place to do so (I will admit that there are times when I forget what the problem is with a certain status). I'm going to go ahead and open more about Thin content to see exactly how that's defined. Looking at the image above, we're defining thin content to be content that is below 200 words. Notice, however, that the recommended resolution calls on you to evaluate the page, since it could be a case where the page is suited for thin content. That is, the amount of content used on a page depends on the function/purpose of that page. Here we can see which pages have the same content, the same title, the same description, and the same H1. Now we can decide which page to change and which page to leave alone. As an aside, and since links are just that important, the page level report shows you all of your links along with their status code and is broken up according to internal and external links. You can also see which pages contain a link to the page along with the anchor text used. Handling the technical aspects of your site is often a never-ending process, so it's good to take stock of where you are and what progress you've made. Not too shabby. Now what? Let's assume we've dealt with our duplicate content issues. We've updated some content and perhaps have redirected some pages, or applied the canonical tag. Our site is hopefully healthier than it was in the past. But how do we know? That's where I head to the last tab of the Site Audit Report, the Compare tab. Here I'll take a look at how I have performed since my last crawl, or any other crawl I've executed to see how my overall progress is looking. The report offers you a look at how you've done overall, and as you can see I have one less issue this time around! However, and as exciting as that is, I highly recommend you look at the report on a per item basis. If we look within the Errors category, you can see a lot of progress has been made with eliminating duplicate content and dealing with broken internal images. Notice, you can use this report to determine when an issue arose. For example, I know that my 4xx error had to have developed between early August and early October since as of August 1, no such error existed. Knowing this is really helpful, especially if you've made some sizable changes to your site during that time as there's a good chance those changes brought about that error. At the same time, you can use the data here to catch yourself and pick up on areas you've been ignoring. As I said earlier, technical SEO implementation and performing a site audit is no easy task as it encompasses so many different site aspects. It's easy to miss or skip over any given item at any given time. Via the Compare Report you can pick up on those instances. For example, if we look under the Warnings section you can see that I've glossed over dealing with images missing alt tags. Certainly an item I should get to and now I know. By the way, if you click on any of these issues, the Site Audit Report brings you right back to the Pages tab so that you can get on it! I'm really very fond of this section of the report. It gives me good insight as to both a site's strong and weak points. More importantly, the report helps me to refocus whenever I get lost in and preoccupied with the matter at hand. I should mention, that you can also check off issues as you resolve them. 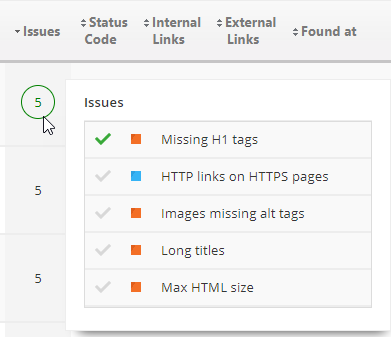 Within the Pages tab, should you hover over the number of issues a page contains, a checklist will appear. The tool gives you the option to check off any items you may have completed. What I find really helpful is that the tool puts a green circle around the number of issues once you check an item off. So imagine you do an audit, review it, check a few things off, and come back to it a few days later... the green circle will tell you that you started marking some issues as fixed but still have some open items. For the record, once you complete all the issues for a given page, the circle goes full-on green (i.e., the circle outline becomes filled in). 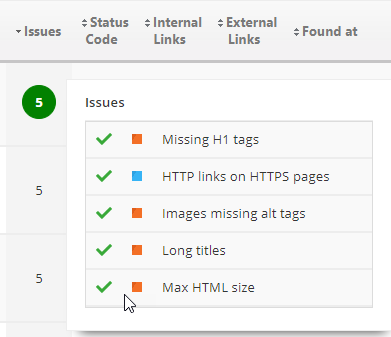 Once all of a page's issues have been resolved, the green indicator outline becomes filled in. I really love this element. Really easy, super helpful, and most importantly - time-saving! I hope this little site audit journey has shown you that executing and analyzing a site audit does not have the be the mountain that we generally think it is. There are ways to simplify the process and get some solid guidance along the way. It's precisely for these reasons that we've developed our new Site Audit Report. If our site audit tool does anything, it's make the technical optimization process so much easier and less overwhelming. I'd love to hear if our new Site Audit Report has made your technical optimization easier and less daunting! Reach out and share your experiences, comments, and questions!